FLORIDA 38 • SHOPPING CENTER BUSINESS • August 2018 the well-established retail markets," she says. GROCERY DIVERSIFIES Although Publix is the leader, the Florida-based grocer isn't the only one continuing to plant flags in the market. 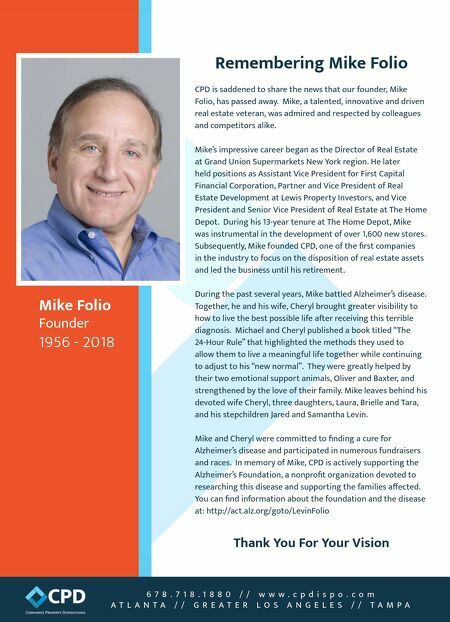 Specialty grocers with small- er footprints such as Sprouts Farmers Market, Earth Fare, Trader Joe's and Lucky's Market are rapidly expanding. "We've probably seen the biggest entrance of new grocers in the state of Florida in the last 12 months than I've seen in my career," says Crossman of Crossman & Co. "And it's a spectrum of different kinds of grocers." As shopping habits change and cus- tomers search for more variety in their grocery options, the need for special- ty grocers is exploding and Florida is reaping the benefits. "People go to Sprouts for their fresh vegetables, Trader Joe's for their pre-prepared meals, and end up at Publix for their meats and subs," says Alex Wright, senior director of Franklin Street in the firm's Tampa office. "It's very different than it was a decade ago, when you would just go to one store to get everything you need." At the end of May, Asheville, North Carolina-based Earth Fare opened its first location in South Florida. The or- ganic and natural food grocery store is located in the Mainstreet at Midtown Shopping Center in Palm Beach Gar- dens. From Tallahassee and Gaines- ville to the Tampa Bay area, Earth Fare currently operates nine stores throughout the state. Sprouts Farmers Market, headquar- tered in Phoenix, is also increasing its presence. The grocer, which specializ- es in fresh, natural and organic prod- ucts, currently operates five stores in Florida and will open its first Orlan- do-area location in Winter Park at the end of October. According to a release from the company, Sprouts has plans to further expand in the state with stores in Clearwater, Deerfield Beach, Naples, Oviedo, Riverview, Trinity and Wellington. Continuing the organic trend, Lucky's Market is also aggressive throughout the state. The Boulder, Colorado-based niche grocer current- ly has 13 stores open in Florida, and two more slated to open this year. Trader Joe's, the California-based grocer known for its low prices, unique food items and Hawaiian-shirt clad employees, first opened in Florida in 2012 with a store in North Naples. Just six years later, the grocer operates 18 locations throughout the state. On the higher-end side, grocers like Whole Foods Market are continuing their expansion, but Florida is seeing an influx of grocers across all socio- economic levels, according to Dottore of The Shopping Center Group. Discount grocers such as Aldi, Save- A-Lot and Sedano's are all active throughout the state. "The landscape has changed with the number of grocers out there," says Brian Bern, senior director of Frank- lin Street in the firm's Tampa office. "Specialty grocers have really turned the table on what was traditional, and as a result you're seeing everyone try and adjust to accommodate." Facing increased competition, Lake- Sprouts Farmers Market currently operates five stores in Florida and will open its first Orlando- area location in Winter Park at the end of October. 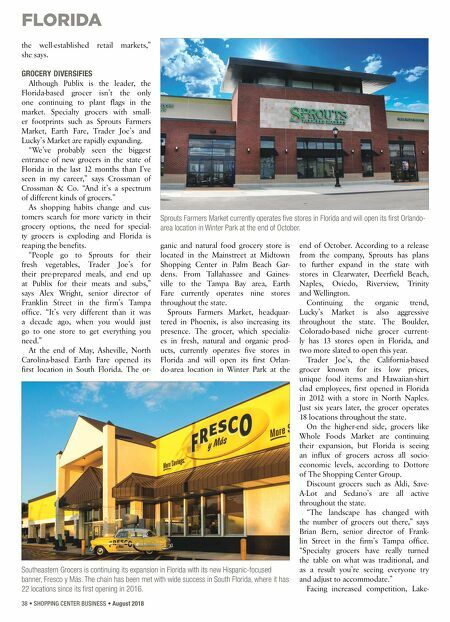 Southeastern Grocers is continuing its expansion in Florida with its new Hispanic-focused banner, Fresco y Más. The chain has been met with wide success in South Florida, where it has 22 locations since its first opening in 2016.